From Roses to Rainbows: Running Behind? BEAUTIFUL! My front yard is filled with dogwoods. And the funny thing? 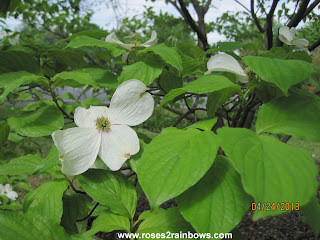 A week ago I was driving my daughter to school and said, "Are the dogwoods blooming???" She said, "DUHHHH!" Ha ha! So I went home, stood in my front yard and said hello to spring. How could I have missed it! See, even I am slow...trying to get caught up on my blog reading. Our Spring is very "behind" this year in Kansas City. Here were are in late April and still having freezing night time temperatures. Usually I have planted my pots with annuals and started some of the perennials. I have done 2 pots and am forced to haul them in at night. The weather guy is still talking about more frost so we aren't out of it yet. Wow. Those pictures are gorgeous. We're having a regular Spring, I guess. Some days its freezing and raining. Other days it's warm & sunny. 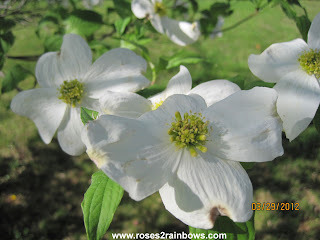 Wow, my dogwoods bloomed a month ago and the flowers are long gone. We are definitely on the cusp of summer with temps occasionally in the 90s. Well, we don't have flowers yet but we don't have snow either, so at least there's that! Wow! Love the dogwoods and the house they decorate. Hummmmm great memories. Our spring has finally come with amazing cherry trees. But they can't compare with that dogwood that holds my heart strings...wait, it's really you holding the other end of that string! Hi Linda .. we're so behind too - four weeks someone was saying in the Welsh borders, but once the day starts getting longer the leaves start popping out ..
Katherine- Sometimes we are so busy we fail to see what is right in front of us. Sadly, that is normal these days. Hello Spring!! Babs- I hope Spring arrives in your garden soon. Winter has overstayed her welcome in so many places. Cheryl- Me too! I am a week behind in answering comments. Hopefully the warm weather will arrive to stay soon. Meleah- I love those warm and sunny ones. I will complain about it being hot and dry later, though. Sara- I figured your part of the country was already in full summer mode by now. I remember the card you sent me a few years ago. It had a picture of a dogwood on it that looked just like an angel. Talon- I may lament the fact that we don't get many good snows here in the South, but on the other hand, I'm glad our winters aren't as severe as our Northern friends. When March/April rolls around, I am ready for some warmth. Unfortunately our Spring is usually short and then it's hot. Ashley- And you are on the other end of my string. I really miss you. The petals are falling off now and the azaleas are blooming - they're late too. Hilary- I see that it's not just here in the States, it's all around the world. Babs said her garden is bare and she is in the UK as well. I hear Spring is late in Sweden, too. Hopefully we will all be warm and sunny and our gardens filled with flowers. NickyF.- There's a lot of places that would be happy with that! We're behind here in southern Ontario too. I smacked my first skitter of the year yesterday. Last year, I smooshed one in March.